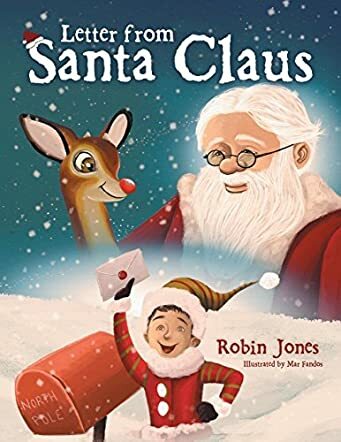 Letter From Santa Claus by Robin Jones is a children’s fantasy adventure that mixes a bit of reality right along with it. The time is early 1949 and Robin, our main character, is a young boy who catches pneumonia and spends a considerable amount of time in the hospital recovering (almost a year). Later that year he writes a letter to Santa, in part because his father always read him the story about Rudolph. Santa writes back, creating a magical story of the North Pole, his reindeer and his elves. This book is charming, creative and a bit serious at the same time. People died of this disease (young and old) at that time, so it shows the seriousness of the situation. For this very reason, I think children who are hospitalized or recovering from sickness will like this story, no matter the season, because of the support it shows for those who are suffering from an illness. The artwork of Letter From Santa Claus by Robin Jones has captured the time period perfectly. The clothing, the cars, the buildings—they all point to this era in the past, giving the story a strong support. The pictures are colorful, detailed and professionally done. I won’t give the rest away, but I enjoyed the new twists in Santa’s letter to the young boy, bringing comfort and love to a child who is hurting. That may just be my favorite part. This is certainly a treasure that children and parents will enjoy reading time and time again for years to come. Highly recommended.